Most Insurer Medical Policies now recognize Oral Appliance Therapy as a medically necessary option for patients with documented Mild to Moderate Obstructive Sleep Apnea. Many also consider it a valid conjunctive therapy for use with CPAP, or as additional therapy for Surgical Intervention that results in residual OSA. Each policy varies and is subject to the plan and benefit limitations in effect at the time that the service is provided, and therefore it is highly recommended to precertify Oral Appliance Therapy prior to providing the service to ensure coverage and limitations. Only FDA Registered Devices (Prescription) are considered Medically Necessary and some plans only cover Custom Made, custom fitted devices and some require fitting by dental personnel. E0485 Oral Device/Appliance used to reduce upper airway collapsibility, adjustable or non-adjustable, prefabricated, includes fitting and Adjustment. ONLY REFERENCE ONE CODE as recognized as medically necessary by individual insurers. Most Major Insurer Medical Policies recognize Oral Appliance Therapy (OAT) as a Medically Necessary treatment alternative for patients positively diagnoses with Mild to Moderate OSA, many as a first line treatment option as opposed to CPAP. Several Medical Policies are linked in the right sidebar. The AHI is equal to the average number of episodes of apnea and hypopnea per hour and must be based on a minimum of two hours of sleep recorded by polysomnography using actual recorded hours of sleep, (i.e., the AHI may not be extrapolated or projected). 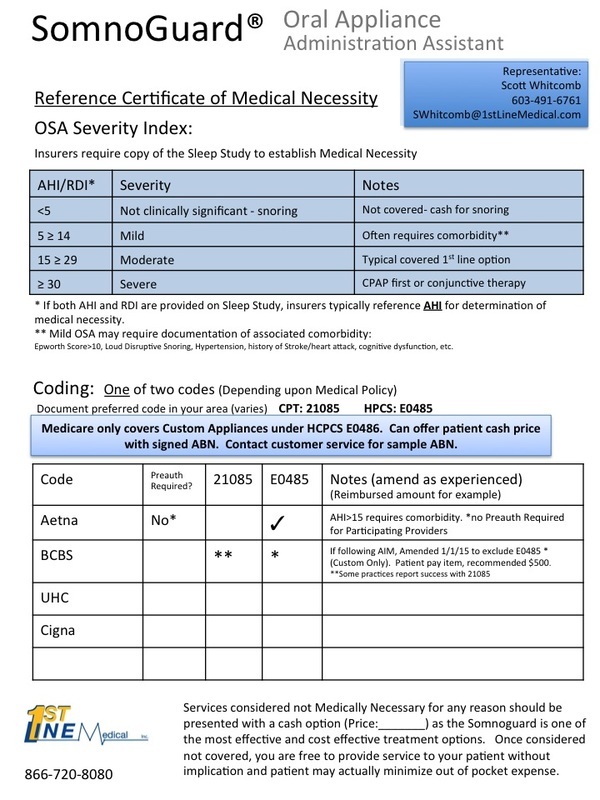 Note: For the purposes of this document, the terms apnea hypopnea index (AHI) and respiratory disturbance index (RDI) are interchangeable, although they may differ slightly in clinical use; an AHI/RDI greater than 30 is consistent with severe obstructive sleep apnea. In some cases, respiratory effort-related arousals (or RERAS) are included in the RDI value. These RERA episodes represent EEG arousals associated with increased respiratory efforts but do not qualify as apneic or hypopneic episodes because of the absence of their defining air flow changes and/or levels of oxygen desaturation. Custom-fitted and prefabricated oral appliances are considered medically necessary for persons with OSA who meet the above medical necessity criteria. Documenting Specific Insurer Medical Policy and plan criteria is supported by our Administrative Assistance document.